Standardization is the process by which the raw data are transformed into new variables that have a mean of 0 and a variance of I. When the data are standardized. the intercept assumes a value of. 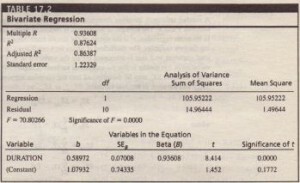 The term beta coefficient of beta weight is used to denote the standardized regression coefficient. In this case. the slope obtained by the regression of Yon X. Byr is the same as the slope obtained by the regression of X on Y. Bxy Moreover. each of these regression coefficients is equal to the simple correlation between X and Y. Can variation in sales be explained in terms of variation in advertising expenditures, prices, and level of distribution? • Can variation in market shares be accounted for by the size of the sales force, advertising expenditures, and sales promotion budgets? 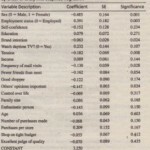 • Are consumers’ perceptions of quality determined by their perceptions of prices, brand image, and brand attributes? • How much of the variation in sales can be explained by advertising expenditures, prices, and level of distribution? • What is the contribution of advertising expenditures in explaining the variation in sales when the levels of prices and distribution are controlled? • What levels of sales may be expected, given the levels of advertising expenditures, prices, and level of distribution?